Best Chinese Knives: Reate Knives - From A Dai Clone Making to Todd Begg Steelcraft Series Manufacturing! Reate Knives - From A Dai Clone Making to Todd Begg Steelcraft Series Manufacturing! The story of the Chinese knife brand Reate is a real modern Cinderella story of the knife world. It all started from a small Chinese knife manufacturer called A Dai, who produced high end clones of popular brands - GTC, ZT 0888, F95 and others. 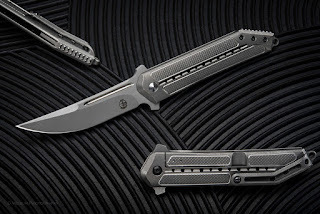 It's most known model was the A Dai 0999, which is an unaccredited copy of Dmitri Sinkevich's design The Koordinal, that was first made by Shirogorov and later became the ZT 045X series of knives from Zero Tolerance. A Dai Knives had exceptional value and great quality of production, exceeded maybe only by Kevin John, and they became noticed and appreciated in the Chinese knife world. In order to move to the big playground (which is the US market), they needed a change, they couldn't just go there as the clone maker A Dai, whose knives are being sold on AliExpress. So David Deng (the owner of the Reate brand) re-branded the company into Reate. Another smart move he did - was sending a knife to Jim Skelton (the maker of brands), who showed the Horizon model on his channel, built up the appetite - and it took off from there. Reate kept their production levels high and their designs original, so success and fame came shortly. They also started to produce knives for Liong Mah. And soon they hit the bulls-eye - Reate were trusted by Todd Begg (and his brother Mark) to manufacture the production versions of Begg's knives - the Todd Begg Steelcraft series. This is a dream-come-true contract for any knife manufacturer, not to say for a Chinese one. And they did a hell of a job with the series!I think Reate have established themselves as one of the leading high end production knife manufacturers, and I see nothing but a bright future for them.